Good morning (afternoon or evening depending on where you are in real life), and welcome to my little corner of the blogging world. A massive thank you to the wonderful Beth at Plum and June for giving me the opportunity to host the link up this week *gives a little curtsey*. If you want to find out more about me, then either pop over to the Let's Get Acquainted New Blogger Blog Hop 2013, or my Liebster write up. So, let me tell you what I've been up to this week, sewing wise, I've been focused on binding this Hexy quilt for my little one. I started it 2 and a half years ago (it was my very first quilting project), and although it has been put aside, sometimes for months at a time, I am now quite determinedly in the final throws of the finish. It is 3/4 bound and the final side will be completed tomorrow, and then I plan on quilting the binding hexagons to secure it all in place. I am loving the look of the binding Hexies, it is such a cool and unusual way to bind a quilt, this tutorial gave me the idea, and it is really simple process. 1. Link up any recent sewing/quilting post. 2. In your post or on your blog, please include either a text link or a button letting people know about this link up and link it back to this post. 3. Visit at least the two bloggers who link up before you and everyone who visits you from this post. 4. When the link tool asks for your name, enter your favourite fabric line. 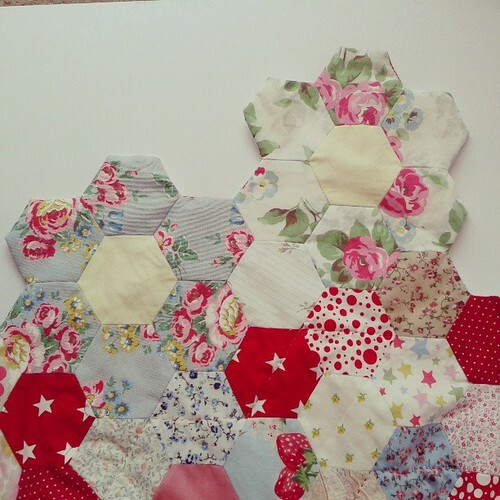 lovely hexies, can't wait to see it finished! Gorgeous hexies. Love those polka dots . OMGoodness the binding hexies is awesome! I love how it keeps the feel of the shape - and really adds visually! Wow hexies, especially binding them. I am quite impressed! Another thing I will have to put on my list to try! The hexes look great. Especially the binding ;) ! I never saw hexie binding. That black and white project on top looks great too. I was wondering the process for binding hexagon quilts. 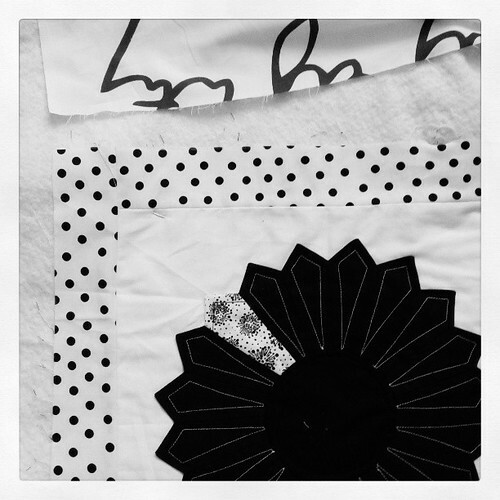 I am appliqueing mine for a pillow project. Whew! Dodges that one. Can't wait to see yours done. Those hexies are gorgeous. It is going to be a fantastic quilt! The binding it awesome. Thank you for hosting. They look great! I find the idea of binding around hexies daunting, but I think it's so fab to just stretch yourself and Do It! You know I love you quilt and look at all those linkies! Woohoo! 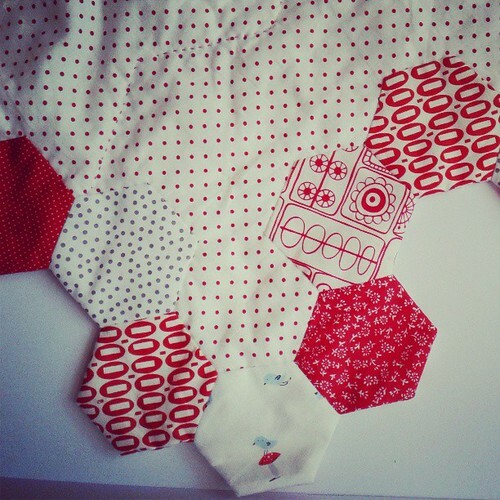 That is a wonderful way to finish a hexies quilt, I will keep it in mind if/when I start a new hexie project... Don't know if I'd ever manage to make a whole quilt of them though. I'm interested in seeing what the quilt looks like with hexagon binding! Binding hexies? That's a new one on me!